As the Northern Hemisphere of our giant ball of rock celebrates autumn, trees further away from the equator are turning all sorts of colors and dropping their leaves like mad in preparation for the winter to come. It's an annual dance, but one that still manages to find unique steps, tunes and nuances along the way. So when our daughter and I headed into the woods for a closer look - see here for more - it was a given that we'd return with a story that read a little differently than it had in past years. 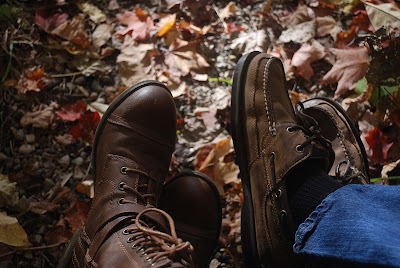 This shoe-selfie (is there even such a thing) is just one snippet from our adventure. Now I want to see what you can come up with, as well. Your turn: I'm pretty sure you already know how this works. But just in case you don't, here's the short version: post a pic that supports this week's theme - autumn - to your blog or website. Leave a comment here letting everyone know where to find it. Visit other participants, then repeat through the week. More details available here. Thematic is a non-competitive activity that lets us stretch our photographic boundaries a bit. I can't wait to see what seasonal goodness gets shared along the way! Beautiful shot. Bet it was perfect scenery! I can never resist shuffling my feet in autumn leaves like these. I have some Autumn Colors.